This salad is synonymous with my Great-grandma Welker. She is the only person that I know that ever made this for me, and I can’t recreate this without thinking of her. She was always in the kitchen making pork and kraut, chicken, kolacky cookies, and even homemade phyllo dough for apple strudel. I made this yesterday as part of our family’s impromptu Oktoberfest dinner last night at my mom’s, and no one turned down the offer of taking the leftovers home. Toss some chilled chicken into this the next day, and you have a complete meal! 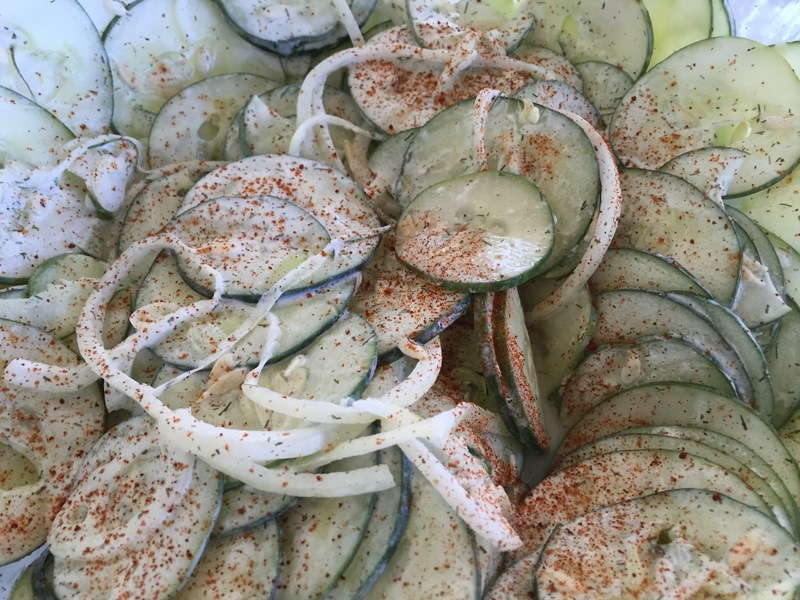 Using a mandolin, slice cucumbers and onion. In a large bowl, whisk together yogurt, vinegar, dill, and salt and pepper. Add in cucumbers and onion and stir to coat. sprinkle with paprika and cover and chill. I like to make this several hours before serving, so the flavors infuse. Guten appetit!